According to the Lava Jato judge, Temer is head of a criminal organization that has been operating for forty years in Rio de Janeiro. RIO DE JANEIRO, BRAZIL – Former President of Brazil, Michel Temer, spent his first night in a windowless room at the federal police headquarters in Rio de Janeiro and is expected to be questioned by police on Friday. Temer has been accused of receiving bribes for works at the Angra 3 Nuclear Power Plant. The arrest is part of the mega Lava Jato (Car Wash) corruption investigation. Brazil’s former president, Michel Temer, spends first night incarcerated at police headquarters, photo internet reproduction. 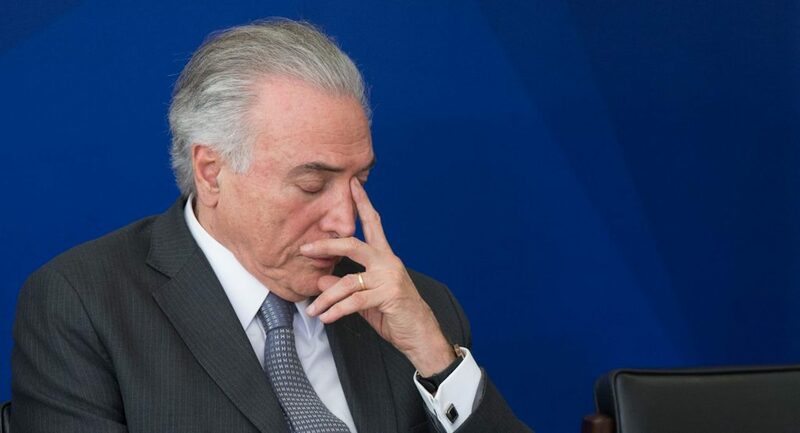 “Michel Temer is the leader of the criminal organization and the main person responsible for the acts of corruption described here [arrest warrant],” said Judge Marcelo Bretas in his sentence. According to Judge Bretas, Temer is head of a criminal organization that has been operating for forty years in Rio de Janeiro and his group is said to have received over R$1.8 billion from engineering and construction companies in return for contracts of the nuclear plant. Prosecutors say that a spreadsheet found during the investigation identifies payments and pledges over a twenty-year period from Argeplan to a ‘MT’. MT, according to officials, refers to Michel Temer. The regional prosecutor of the Republic, Eduardo El Hage, explained that the value of R$1.8 billion is the result of the sum of all crimes allegedly related to the group in the last forty years. “There is a table detailing all bribing values. They (Temer’s group) have been robbing public agencies for decades,” said regional prosecutor Eduardo El Hage. 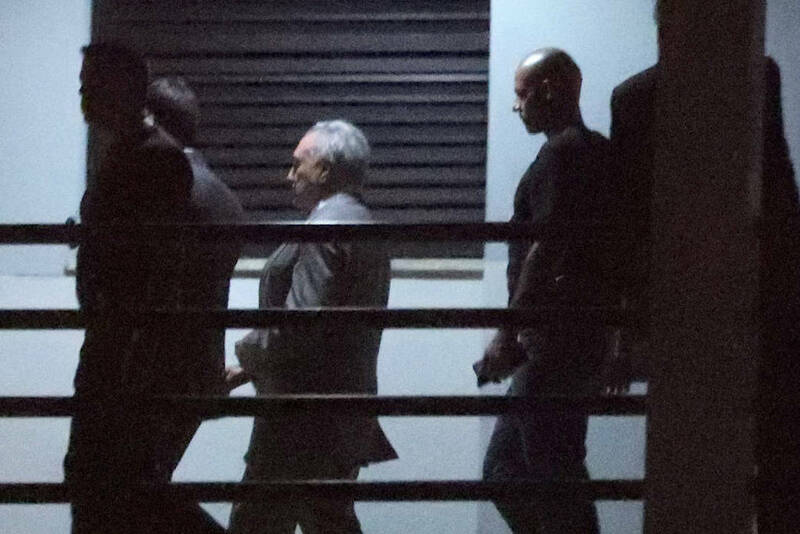 Along with Temer, federal police also arrested former Temer cabinet member and former Rio de Janeiro governor, Wellington Moreira Franco, Temer’s personal friend, João Batista Lima Filho (also known as Colonel Lima) and seven others. The investigation was based on a plea bargaining deal made between prosecutors and executives at Engevix company, one of the firms accused of bribing public officials. Former President Michel Temer is arrested in Sao Paulo, charged with corruption, photo internet reproduction. “Justice has to be the same for everyone and everyone [has] to answer for their actions,” Brazil’s current President, Jair Bolsonaro told journalists in Santiago, Chile, where he is taking part in a meeting with other Latin American leaders. “What led to this situation, it seems, are the political agreements being made in the name of governability. You do not create governability with this type of (political) agreement,” added Bolsonaro, whose main campaign promise was to fight corruption within the government. Brazil’s Vice-President, Hamilton Mourão, also commented on the arrest of former President Michel Temer, “It is very bad for the country to have a former president arrested. Now they need to follow through with the investigations,” he told journalists in Brasilia. For Mourão, the arrest of Temer should not disrupt the progress of the projects in the National Congress, especially the social security reform. Temer is the second president in Brazil currently under arrest. In April of 2018 Worker’s Party icon and former president, Luiz Inacio Lula da Silva was arrested in São Paulo, charged with money laundering and passive corruption. Former Rio de Janeiro governor, Moreira Franco, is the fifth governor of the state to be arrested, all charged with corruption. Moreira Franco was sent to a jail in Niteroi, where another former governor, Luis Fernando Pezão is also being held.